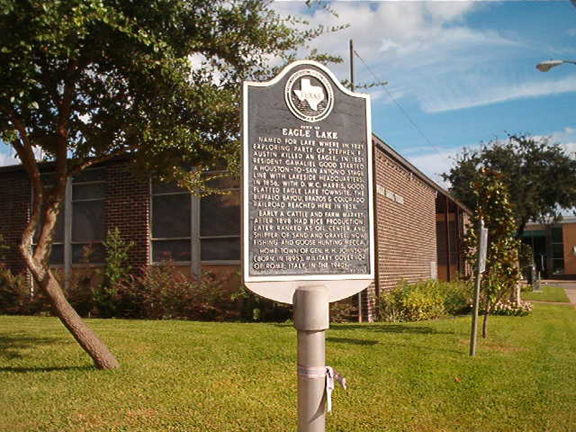 Named for lake where in 1821 exploring party of Stephen F. Austin killed an eagle. In 1851 resident Gamaliel Good started a Houston-to-San Antonio Stage line with lakeside headquarters. In 1856, with D. W. C. Harris, Good platted Eagle Lake townsite. The Buffalo Bayou, Brazos & Colorado Railroad reached here in 1859. Early a cattle and farm market; after 1898 had rice production; later ranked as oil center and shipper of sand and gravel. Now fishing and goose hunting mecca. Home town of Gen. H. H. Johnson (born in 1895), military governor of Rome, Italy in the 1940s.